In 1996, the Container Store wanted to open a new location in Manhattan, NY, but when you’re walking into one of the oldest and most prestigious retail locations in America, you can’t just set up shop; you need to make a statement. 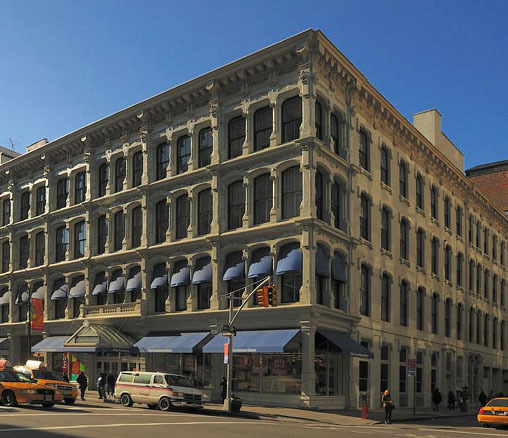 The folks behind the Manhattan Container Store decided to repurpose an NYC classic: a cast iron architectural landmark, previously owned by dry goods tycoon, B. Alton & Co. This was good publicity, since it demonstrated the company’s commitment to historical restoration, but it proved to be a serious architectural challenge. Fortunately, it was a challenge to which Stromberg Architectural had an answer: architectural fiberglass. The 19th century witnessed the peak of cast iron architecture, but by the end of the 20th century, it was a relic of the past. One of the biggest problems with cast iron architecture was the huge amount of maintenance that was required for upkeep. However, even with perfect upkeep, the iron was doomed to eventually show signs of wear and weathering, and since the original foundries that created this cast iron had gone under long before the Container Store began their 1996 restoration, it became necessary for them to figure out another way to restore the ancient cast iron. Fortunately, Stromberg had a solution. Architectural fiberglass, an incredibly diverse synthetic compound, can be used to seamlessly patch damaged cast iron without affecting the original aesthetics of the building. To accomplish this task, Stromberg Architectural fabricated dozens of columns and pilasters for the interior and exterior of the building, faithfully adhering to the 19th century aesthetic, while upgrading the structural and visual integrity of the building. Architectural fiberglass may not have the rich history of cast iron, but it presents several major practical improvements. GFRP is light-weight, easy to install and relatively inexpensive. Better still, it is weather and water resistant. It can even stand up to most common corrosives you would expect a building to be exposed to in a place like Manhattan, such as acid rain and smog. Architectural fiberglass will not rot, rust, corrode or delaminate over time, making it more than a “quick fix.” Indeed, if you want to build something to last, build it with GFRP. Stromberg architectural fiberglass is long-lasting and will not rot, corrode or delaminate over time. American-made, Stromberg GFRP products are perfected in the shop and do not require specialized experts to install. Manhattan, NY architectural fiberglass, architectural fiberglass in Boston, MA, architectural fiberglass in Washington, D.C., architectural fiberglass in Brooklyn, NY, Katonah, NY architectural fiberglass, Gonzales, TX architectural fiberglass, architectural fiberglass in Austin, TX and more. For more information on GFRP, visit Stromberg Architectural Products. The experts at Stromberg will help you make your architectural fiberglass restoration a success. They offer design assistance, specifications, and CAD details. If you have questions about Stromberg GFRP, call (903)454-0904. The initial consultation is free.